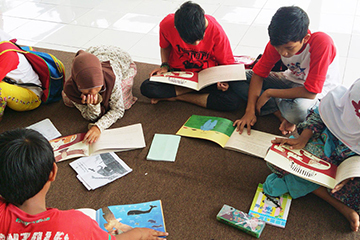 Donated books to the University Darma Persada in Eastern Jakarta city. 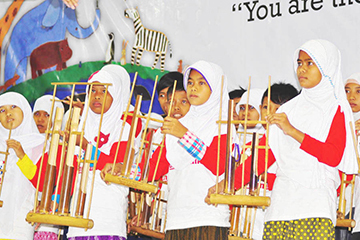 On 15th March 2014, the Indonesian version “You are the only one, but never a lonely one” was donated to children in Indonesia with support by NTT DATA Corporation. The glorious donation ceremony was held at the student’s hall of University Darma Persada in Eastern Jakarta city, in the presence of Japanese Ambassador in Indonesia H.E. Mr. Yoshinori Katori, President of PERSADA Mr. Rahmat Gobel, Head of Student Affairs at Ministry of Education and Culture Mrs. Arfah Laidiah, with attendance of approx. 280 people in all (the representative children and so on). Many students from each school participated in the ceremony and welcomed us with reading the picture book aloud and musical performance with ethnic instruments. 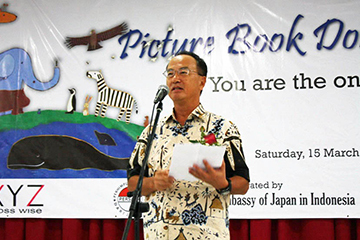 Furthermore, the message video of JAXA Astronaut Koichi Wakata sent from the space station, our original animation film, and the short film of Indonesian children telling their dreams were shown, and the ceremony was so stirring which deepened the relationship between both countries. 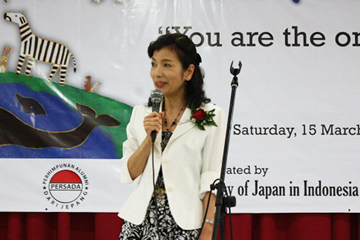 Japanese Ambassador in Indonesia H.E. Mr. Yoshinori Katori. 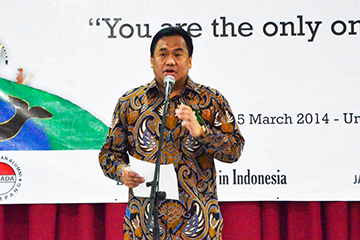 President of PERSADA Mr. Rahmat Gobel. Visited Al Falah special primary school in Bekasi city. On 16th March, we visited Al Falah special primary school at the garbage collection place area in Bantar Gebang district in Bekasi city. 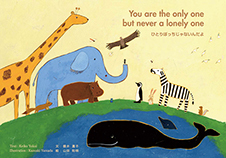 We read the donated picture books to children, folded a piece of paper into the figure of a crane, played the game of scissors-paper-rock in Japanese and so on, we spent fun exchange time with children. 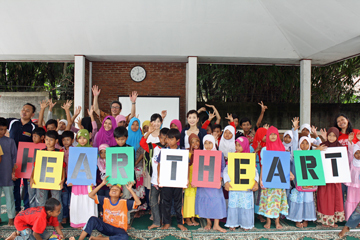 Our original animation product with the theme “HEARTHEART” which is our activity’s spirit ”HEARTHEART – the EARTH is supported with our HEART & HEART” was screened at the school, next the message video of JAXA Astronaut Koichi Wakata from the space station. As we received the request from the teachers that they want Indonesian children to sing the song which is featured song in this animation product, from now on, this song will be taught children with teacher’s guitar accompaniment. Children learned paper cranes seriously. Read aloud the picture book. 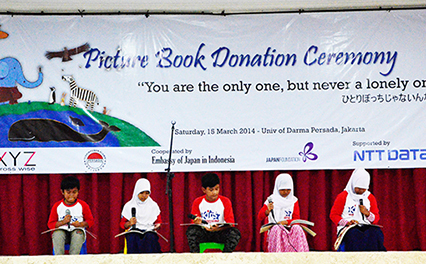 “The daily Jakarta Shimbun” reported the picture book donation ceremony in East Jakarta. 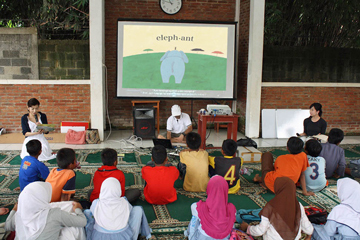 “WEDGE” reported the picture book donation for the education assistance in Indonesia. 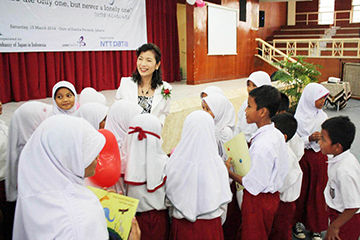 NTT DATA NTT DATA Donates 4,000 Picture Books for Children in Indonesia.